Note: This post originally appeared in May of 2009. Technical issues required that I delete the original post and repost it. Isn't it wonderful when the grand kids first show off their ability to count? For the most part, kids learn to count on their own! That's why the set of numbers, 1, 2, 3, 4, 5, … are known as the natural numbers. They just come naturally. Kids connect numbers with real objects. Two cookies are better than one cookie. Abstract ideas such as "number" are best met in the form of "real" objects. The ancient Greeks understood this. They used pebbles to form geometric shapes, discovered number patterns in these shapes, and laid the foundation of mathematics. Early Greek mathematicians used the visual simplicity of geometric shape to discover and think about abstract number relationships. Why shouldn’t our kids and grand kids do the same? Fish fifteen pennies out of your piggy bank, gather the kids around the kitchen table, and let’s explore figurate numbers. The place to start is, naturally, with the set of natural numbers. Lay a single penny on the table. Ask one of the kids to use pennies to lay the next number, two, in a line, under the single coin as shown in the diagram below. Have the kids use pennies to construct the third, fourth, and fifth rows. Now this is so simple and obvious that my grand kids might take it as an early sign that I am beginning to see profundity in the simplest of situations. But, ah! It stays simple, but gets better. Ask one of the kids to move the row of two pennies up and under the single penny so that they snuggle together, as can be seen at the top of this diagram. Ask them to identify what shape the three coins form when nudged close together (it helps to lay toothpicks or matches along the edges). As the Greeks observed, the three coins (pebbles) form a triangle. 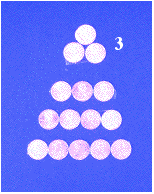 The natural number three is called a triangular number. 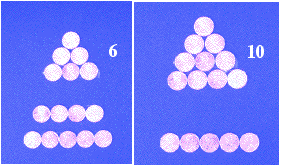 The natural numbers four and five are not triangular numbers because no matter how hard you try to arrange five pennies in a snug, triangular form, there's always a hole (see above picture) and we won't allow a hole to spoil our pattern. 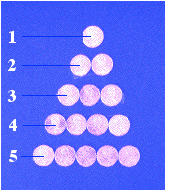 Have the kids fit the third row of pennies under the second row and observe that the 6 pennies do form a triangular pattern with no holes. The natural number 6 is a triangular number. Now ask them to move the fourth row under the third row, count the pennies in the four rows, and tell you if the sum is or is not a triangular number (it is). Why? 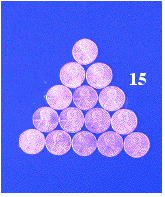 (The ten pennies fit snugly together to form a triangle). Finish by having them move the fifth row up, count the pennies, and decide if the sum is or is not a triangular number. Now for the mathematics. Ask the kids to predict the next triangular number (21) and explain how they got answer (15 + 6 in the sixth row = 21). If they want to keep going, let them. If not, that’s OK too. A good way to summarize the activity is to have the kids write down the natural numbers from 1 through 21 and to draw a triangle around those natural numbers that are also triangular numbers. 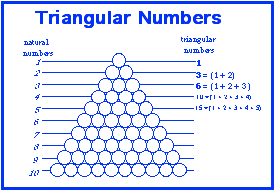 If you would like a free PDF file that let’s the kids color and record the triangular numbers through row ten, simply email www.grandadscience@gmail.com. There are so many directions we can go with this activity but let me just choose one other property of the triangular numbers. The Greeks quickly found that any two consecutive triangular numbers form another class of figurate numbers, the square numbers. Watch this video to see the transformation of the two consecutive triangular numbers, three and six. The second figurate number post can be found by clicking on the following link.